Amazon (NASDAQ:AMZN) stock sat out most of the rally over the past few months. However, it wasn’t alone. Apple (NASDAQ:AAPL) and Alphabet (NASDAQ:GOOGL, NASDAQ:GOOG) also didn’t join the rally, leaving many to wonder what was causing the hesitation. However, over the past few days, we’ve seen a big rally of Amazon stock, signaling that its slumber may be coming to an end. Is now the time to buy AMZN stock? Investors first have to ask themselves if they like the company or if they like the stock. Bullish investors who are purely looking to trade Amazon stock are late. Those who were prepared came into this week long and are now raising their stop-losses and locking in some gains. However, if investors like the company, it doesn’t hurt to wait until the stock’s technicals are becoming more bullish. For investors in that camp, there are plenty of reasons to like Amazon stock. The best thing about AMZN stock may have been its recent cheapness. Until recently, the shares were almost 20% off their highs, and they stayed there for several months. That gave investors a chance to gobble up Amazon stock while it was on sale. But I understand that the valuation of AMZN, as it always has been, is insane. AMZN, however, is not a traditional company and therefore it is not bound by traditional valuation metrics. I know strict, traditional investors will have a field day with that “exception to the rule” explanation, but it’s true. Some investors’ unwillingness to acknowledge such exceptions has kept them from buying the market’s biggest winners, like Amazon and Netflix (NASDAQ:NFLX). You didn’t have to hold these names for 20+ years or buy shares during their IPOs to reap massive gains. We knew what AMZN and NFLX were all about ten years ago and could have made a massive amount of money going long AMZN stock and NFLX stock. In the last decade, Amazon stock has surged “just” 2,420%, turning $10,000 into a quarter-million dollars, while Netflix has jumped almost 6,000% in the same time frame. Even over the last five years — when each company’s long-term, non-cyclical opportunities had already become clear — AMZN stock and NFLX have returned about 375% and 500%, respectively. And given all of Amazon’s opportunities, owning Amazon stock is worthwhile. Its e-commerce unit has considerable revenue and is already well-known, but its other units are garnering attention, too. Its cloud business, Amazon Web Services, has become one of the most dominant in the industry. Given its huge popularity, its ad business has also become quite attractive. It likely obtains annual cash flow of $10 billion from Prime membership fees, and its Whole Foods acquisition gives Amazon a presence in the grocery sector. From a trading perspective, the time to go long Amazon stock has come and gone. That opportunity presented itself last week before the stock’s $80 move. It’s now prudent to trim positions in Amazon stock and raise stop-losses. For longer-term investors, AMZN stock is looking much better, now that it has exceeded its 200-day-moving average. It will look even better if it can hold that mark after this fresh breakout. 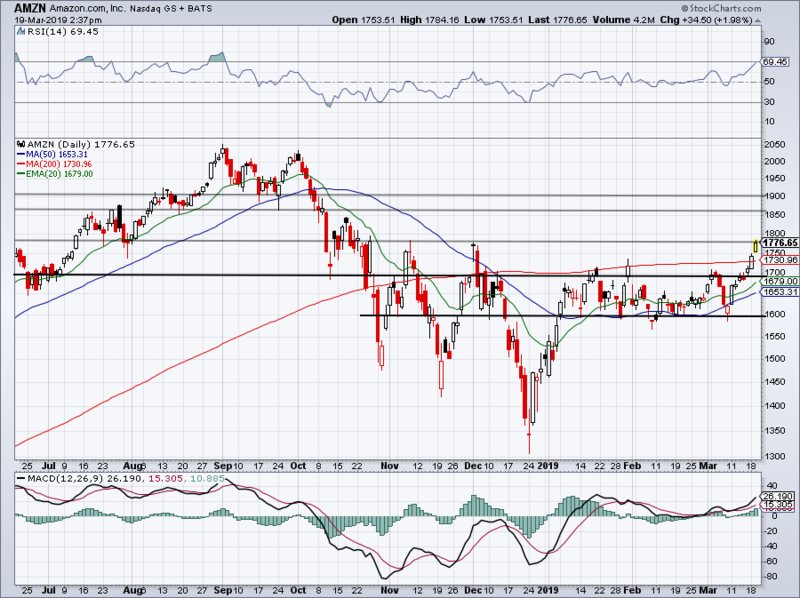 If it can stay above that level, AMZN can begin the process of pushing higher again. Once it climbs over that $1,775-ish level, which kept AMZN in check in November and December, AMZN stock can really start to fly. The next level of interest would come into play near $1,850. Remember, cloud names have been on fire, and Amazon has a significant cloud presence. For the past few quarters, management’s outlook has kept bulls at bay. However, AMZN stock is known for gathering momentum after big declines. Amazon stock fell almost 35% from peak to trough in recent month and, historically, has gone on to post big gains after those types of stumbles. I have no reason to bet against AMZN over the long- term. I also have no reason to bet against it in the short-term if it stays above the 200-day. Bret Kenwell is the manager and author of Future Blue Chips and is on Twitter @BretKenwell. As of this writing, Bret Kenwell is long AAPL, GOOGL and AMZN. The post Amazon Stock Is Finally Breaking Out appeared first on InvestorPlace.